I’m VERY new to sewing with knits. It’s one of the things that I wanted to at least tackle this year, so I’ve been gathering patterns slowly and carefully. I want to set myself up for success so that I keep working at it. One advantage I already have is that I bought myself a serger a couple years back. It is soooo helpful for sewing knits quickly but not necessary to have at the same time. 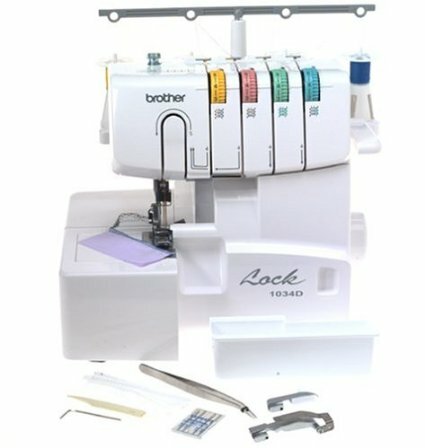 The serger I have is this Brother one that I bought from Amazon. It seems to be the universally accepted “decent serger for an excellent price” out there in internet world. I bet a number of you have it. It only runs $200 and I’ve found that it is WELL worth the price. But back to the Linden Sweatshirt. It is from Grainline Studios and the drawing on the pattern wouldn’t convince most people to buy this pattern I think. 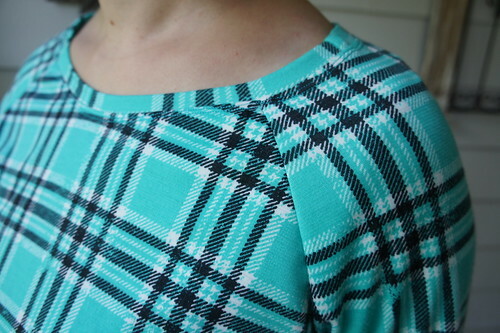 But a quick glance through Pinterest or IG will yield sooo many gorgeous and unique versions of this top that you will be quickly swayed in its direction. I considered it worth the splurge on an Indie pattern (which run significantly more than the big four from big box stores). I’ve made this pattern twice now and have fabric for a third. That’s not something I do with patterns. I rarely make them more than once. But this one is helping me grow in my confidence with knits. The first one I made was a mid to heavy weight knit I bought from fabric.com. I made a size six with no alterations. I’m with others who review this that the sleeves are just ever so slightly too long. 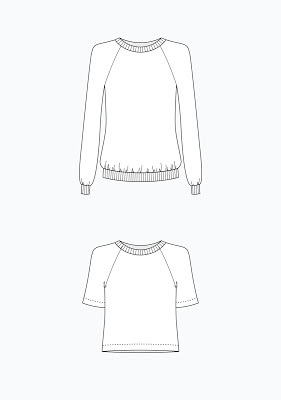 But you might love that with the relaxed sweatshirt concept where the sleeves hang down over your hands a bit. Oh and I broke out a twin needle for the FIRST time in my life!! I adore it! I used it with both versions I made around the collar and the bottom cuff to secure the serged seam down and add a more “professional” look to the shirt. You can get a good idea of the regular length on me in this shot. Not too short but it is begging for you to play with the length…. So enter my second version. This time I used some knits I bought from Anna Maria Horner last year at Craft South (am I the only one who wants to move to Nashville just so I can go to the newly opened store for all the meet ups?!). I only had enough of the two knits I bought to make the shirt exactly this way…so I have contrasting but coordinating sleeves. Also I chose to add two inches to the length this time just for kicks. And after I sewed it, I decided that it needed a bit more shape, so I gently rounded in the side seams a bit to cut it closer to my body…just to eliminate some of the boxy feel. 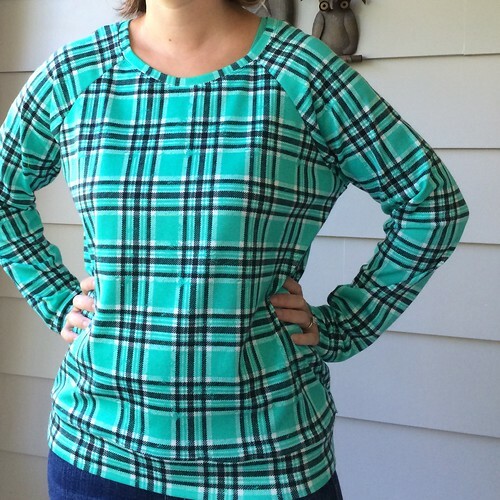 The weight of the knits gives it a “not quite sweatshirt” and “not quite tshirt” feel that will be perfect for fall!! I love that second one. I would love to move down to Nashville too so I could say AMH's store was my LQS. 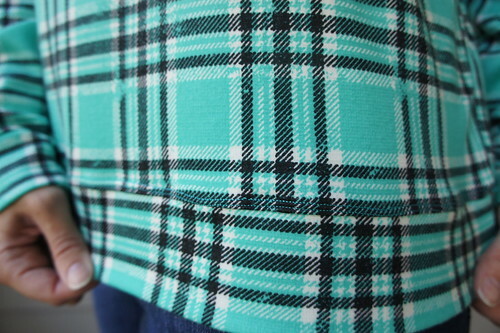 You might want to match the plaid next time. (I know, picky, picky). 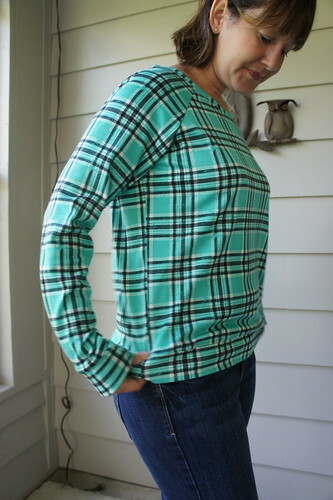 There is a good tutorial on Sew Mama Sew on how to do this–ie match at the armholes and the rest will follow. I think that giving the Linden a bit more shape (ie fit) takes it up a notch. Angela, these are adorable tops! Looks like a great weight for fall–if it ever cools off! 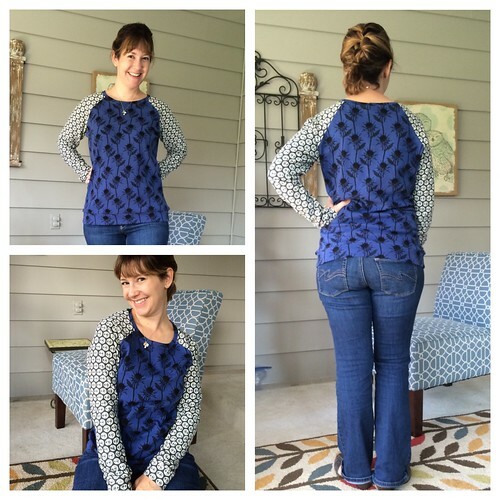 You might want to check out Cheryl Arkison's blog–she's made 3 Lindens this year that are all different and cute, too. 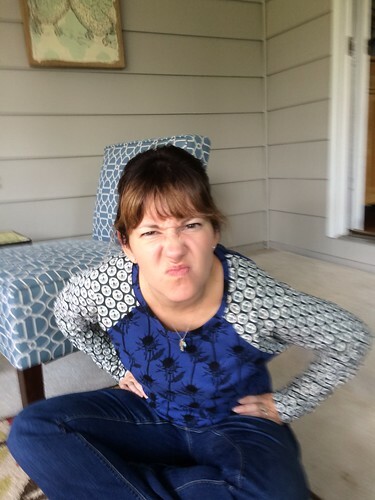 A big shout out to that fine photographer of yours–she really knows how to make Mommy act silly 🙂 Good work! 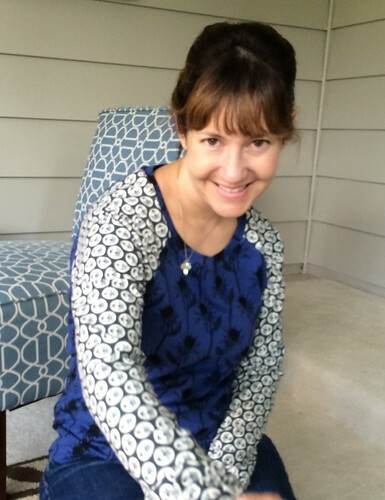 How fun for your daughter to be your photographer and see her work shared on your blog! This will be a great "show and tell" at school for her. Also, I totally agree with you about the drawing on the pattern. The top is much better represented by searching tags on different sites. Your shirts look super comfortable!